this property is an elegant and welcoming apartment situated in a quiet location, a few minutes from the town center. It sleeps three people. 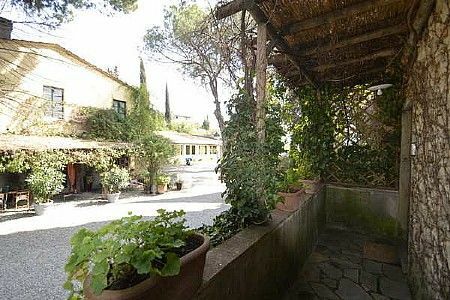 From this property you will enjoy a spellbinding view of the Tuscan hills and of the greenery. this property is 70 square meters (750 square feet). It features a shared swimming pool, a shared patio, two shared gardens, a reserved outdoor area, winter heating and WI-FI Internet access. You will be roughly 1 km (0.6 miles) from the center of Arezzo, where you will find restaurants, shops and public transportation. You will find the bus stop at 200 meters (660 feet). this property is located on the first floor in the main building. You will reach it from the parking area going up a short route that cuts through the courtyard and includes approximately eight stairway steps. You will not need a car to stay at this property. If you do have one, you will be able to park it on the premises, free of charge in a parking space. Built in 1500 and enlarged in 1800, the villa has been restored and transformed into four charming and warmly-colored apartments, Villa Farnia A, B, C e D.
All the apartments are finished with a great attention to detail, and furnished with antiques and with beautiful dressing tables. The villa features 2 beautiful gardens, the first: former hen house area of the Main Villa, it has been transformed by architect Laura Einaudi into a fairy-tale garden from “Midsummer night’s dream”; whereas the original 1600 hen house itself, remained intact, adding a vintage touch to the place. The long antique wood board tank reigns in the center of the garden, inhabited by goldfish, water lilies and aquatic plants; while the canopy bed invites guests to moments of intimacy, reading and rest. The second garden: with its 16th century architecture, is decorated with pools, ornamental plants and flowerbeds; a wrought iron Art Nouveau door adorns the greenhouse. The swimming pool is 12 meters (39 feet) large by 6 meters (20 feet) long. The swimming pool area is equipped with tables, chairs, sun loungers, a gazebo and an external shower. From the swimming pool you will enjoy a spellbinding view of the greenery. You will share the pool with the other guests staying at the complex, and there will be an area reserved for your exclusive use. It is open from mid-April until mid-October. The patio is 30 square meters (320 square feet) large. It is partly shaded by a wood roof and by elegant trees. It is equipped with tables and chairs. From the patio you will enjoy a view of the surrounding buildings and of the surrounding countryside. You will share the patio with the other guests staying at the complex, and there will be an area reserved for your exclusive use. The garden is 5000 square meters (54000 square feet) large. It is partly shaded by imposing trees and by elegant gazebos. It is equipped with tables, chairs, deck chairs, sun loungers and a gazebo. From the garden you will enjoy a broad view of the greenery. In the garden you will also find an area where vegetables are grown and you will be able to pick up available vegetables according to the season. You will share the garden with the other guests staying at the complex, and there will be an area reserved for your exclusive use. The garden is 100 square meters (1076 square feet) large. It is partly shaded by perfumed trees. It is equipped with sun umbrellas and deck chairs. From the garden you will enjoy a characteristic view of the greenery. You will share the garden with the other guests staying at the complex, and there will be an area reserved for your exclusive use. The living room is paved with Tuscan terracotta tiles. The furnishings are warm and elegant, and include some antique pieces. The furnishings include an armchair and a divan bed for one guest. The dining table can accommodate four guests. In this room you will find a satellite television (local channels) and a DVD player. The room has a window with a view of the garden and of the other buildings. You will be able to enter the kitchen from the living room. It is equipped with a four-burner gas cooker, an electric oven, a refrigerator with freezer, a dishwasher, a microwave oven, an Italian-style coffee-maker, an American-style coffee-maker (bring your filters! ), a toaster and other small appliances. Here you will also find a washing machine, an iron and an ironing board. There is a table to seat three guests. The kitchen has a window with a view of the greenery. You will be able to enter the bedroom from the living room through an access area. The bedroom has a wrought iron matrimonial bed (160 cm/62 inches, wider than a queen-size bed). The furnishings include an armchair. The room has a window with a view of the greenery. This bedroom has an en-suite bathroom, equipped with a washbasin, a toilet and a fully enclosed shower. This villa, in Arezzo, boasts a gorgeous valley view sleeping 3 people.